Historically, the projection industry has focused on offering more and more lumens. But is this the right metric to be focused on? Maybe end users, integrators and manufacturers should focus more on the color accuracy and contrast of the projector instead of assuming that more brightness is always better. This is the question that this white paper asks. But the purpose is not to provide a definitive answer to the question, but rather, to lay out some facts and hypothesis and start an industry dialog. This is actually a pretty important question as display makers – both flat panel and projection – need to understand what direction their products should evolve in: higher brightness or higher contract and accurate colors. This question is perhaps most relevant to projector makers, so we will focus the discussion on that platform, although the points should apply to flat panel displays as well. The impetus for this dialog was the release of the BenQ Colorific HC1200, a projector that is optimized for color accuracy and high contrast, rather than traditional brightness measurements. The specs on this projector indicate that it can display 100% of the sRBG color gamut, offers 2800 ANSI lumens, a traditional ANSI checkerboard contrast rating of 510:1 and an on/off contrast ratio of 11,000:1. For a conference room application, is the HC1200 “better” than other popular projectors with 4,000 lumens, but with less contrast and a non standard color gamut? It is the trade offs of color, lumens, color accuracy and contrast that we are interested in exploring – not necessarily which projector to buy. That comes after one understands the trade- offs. At the end of the paper, we will profile one set of tests done that represent one case study for a conference room set up. We encourage others to do additional studies. To explore the issues, we start with background discussion on color performance, contrast and brightness, before discussing the test results. Color performance refers to both the range of colors a display can produce as well as the accuracy in portraying specific colors. Color science is a complex topic and we don’t want to get bogged down in deep scientific explanation, so we will try to simplify the discussion somewhat – offering apologies to the color scientists reading this. In commercial and education settings, there are a number of other color critical needs that need to be considered. Many presentations utilize or replicate images that need to have colors that match the real world. Advertising agencies, clothing manufacturers, and hair color companies are obvious examples of the need to have color accurate displays in a presentation. Human flesh tones are perhaps the most critical to reproduce accurately, but even common items like the tint of a blue jean or the color of a model’s hair are sensitive items that require accurate colors. If these colors are not reproduced faithfully by the display, it will be noticed. In a conference room application, it would not be unusual for animated content or computer generated graphics to have specific colors that may not have a natural world counterpart, but one the artist has selected for a specific effect as well. Whether the artist uses static artwork or an embedded video to be played within a PowerPoint slides, the impact of color can be crucial in a decision making environment. Additionally, colors are often important to the corporate personality of the audience. Items such as embedded logos in a PowerPoint slide need to faithfully reproduce the right colors no matter how difficult they may be to reproduce on a projector or else it can distract the audience during the entire presentation. For example, if the presentation is for Coca-Cola, you better be sure that the red is the right color in both the logos and videos or the client will not be happy. And, if a person’s face looks ashen or green, or the color of the fabric you are about to order is not faithfully reproduced, no one will be happy. People are very sensitive to accurate colors – especially colors they are closely familiar with. A number of color standards have been developed to help ensure that the colors created in production can be reproduced on the display. These include standards like Rec. 709, sRGB, Adobe RGB, DCI-P3 and 2020. Below is an overview of how color space and the various color standards in the industry apply to a typical conference room projector. There are several ways to represent the color space of all visible colors. Probably the most familiar is the 1931 CIE Chromaticity diagram shown below. The horseshoe shaped area represents all the colors that the human eye can see. Interestingly, nature does not create colors to fill this horseshoe, but can be represented by an irregularly shaped circle (surface colors) in Figure 1. 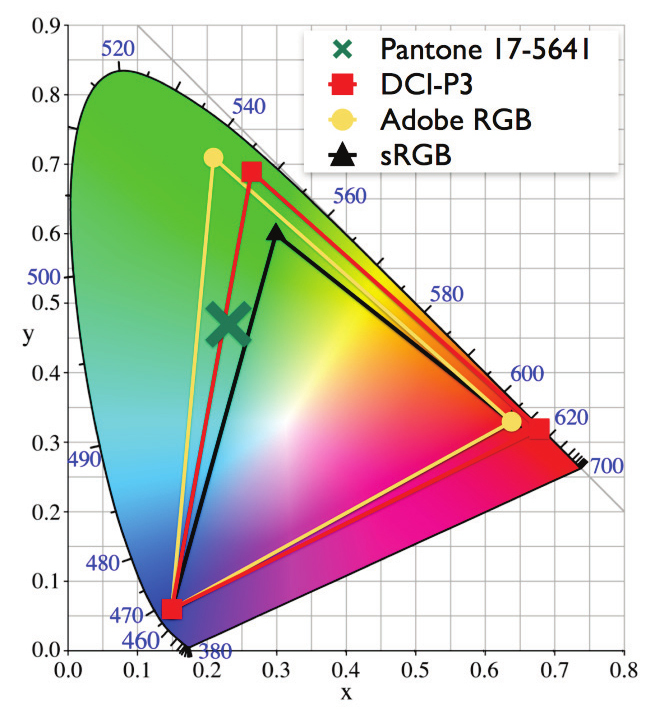 The sRGB color space is the primary standard used in the majority of input devices, such as cameras and scanners, as well as the majority of display devices, such as computer monitors, printers, and smartphones. The sRBG color space uses the RGB primaries (end points of the triangle), with a specific gamma curve. The gamma is what sets the steps between gray levels. Most internet content is rendered using the sRGB color space. The DCI (P3) color space is used in digital cinema, while the Rec. 2020 standard is the new color space for Ultra-High Definition TVs. This is the largest color space and does the best job of showing all of the colors available in nature, plus many additional colors (neon lights, LED lights, computer generated colors, etc.). Figure 2 shows how three color standards are overlaid on the horseshoe of visible colors. Figure 3 shows the sRGB color space along with the Adobe RGB color space, which is popular with graphic artists. It also shows the location of a certain color, in this case, Pantone 17-5641. If you are trying to display this color on a typical sRGB standard computer monitor, you won’t display it properly. Only a display designed for an Adobe RGB or DCI-P3 color space can display it properly, and are usually significantly more expensive than a standard business display using sRGB. The DCI-P3 color space is used only for theatrical cinema production, so is not relevant for this market. Adobe RGB may be relevant for applications in the printing industry. It was designed to encompass all the colors achievable in CMYK color printers, but using the RGB color primaries of the display to represent these colors. The Rec. 2020 color space is coming for UHD-TV, but there is no content currently available in this color space. As a general rule, content should be mastered to a specific color standard, and this standard should be best matched to the display where it is intended to be shown on. For example, TV content will be shown on a TV or tablet, so the colorist needs to render all of his colors within the Rec. 709 color space so they can be reproduced properly on a TV. That is how it is supposed to work. But a couple of things can go wrong. First, the display may not have the capacity to properly display colors in a particular color gamut. In addition, the display that may have originally supported the color space could be have shifted and need to be recalibrated, or have aging issues that may limit its ability to display colors accurately as it did when new. Furthermore, the display itself may not be set to the right color standard for the incoming content. For example, if the content was mastered in Adobe RGB but the display is set to sRGB mode, it will not display the correct colors – even if the display is calibrated for accurate sRGB colors. If the display can support the incoming color space, it can be switched to that gamut. If it cannot, then a transformation from the incoming color space to the display color space must be performed. The accuracy of this will depend upon the manufacturer and is not ideal for the display of color accurate information. The white point of the display is that combination of red, green and blue light that creates white light. But white light has a “color temperature”. Movie content is typically graded and should be displayed using a D65 white point. This means the apparent blackbody equivalent of that point is a white light source at 6500 degrees Kelvin. Some displays are tuned to high white points like 9, 10 or even 11,000 degrees Kelvin. These displays will appear distinctly bluish in their white point. Sometimes this may be preferred when showing text or PowerPoint slides with a bright white background. However, most color standards, like the ones above, call for a D65 white point. The impact on color in presentations has been well documented by the University of Minnesota (and others 2 2 The Importance of Color in Business Presentations ), and the new system contrast specifications highlight the role of contrast in the corporate decision making process. The new BenQ projector is a unique product that is focused around the paradigm of color accuracy and higher native contrast, but at the cost of lower specified lumen rating. Yet despite the lower lumen specifications, the projector was perceived as bright as a top selling model with brightness specifications that were 50% higher and also perceived as more color accurate than a top selling model when setup to the industry standard sRGB color space that is used in virtually every other monitor, printer, or smartphone output device typically deployed in a corporate environment. Given the affordable nature of this new projector (with a street price under $1500), can the ability to deploy high contrast color accurate projectors into conference room and education areas where there is high ambient light impact effective decision making and improve the effectiveness of the projector system environment? We call on industry to continue additional tests to validate these results and help focus developers on those aspects of image quality that have true meaning to the end user. Download a copy of this white paper here. Insight Media is a team of world-class industry experts who can offer a range of services to clients in the cinema, broadcast, ProAV, consumer electronics and display industries. Our team is composed of very experienced industry veterans with strong technical, business and marketing experience. This expertise spans from materials and component, to finished products and out into the professional sales and install community.